Karel Stoel Albums – A Historic Find. One of our hobby’s most enduring members, Jim Fox of the USA (Eu 0095) has gathered the world’s most comprehensive collection of rare plates over many years, some of which had started life in the former legendary collection of Dutchman Karel Stoel, of Utrecht. 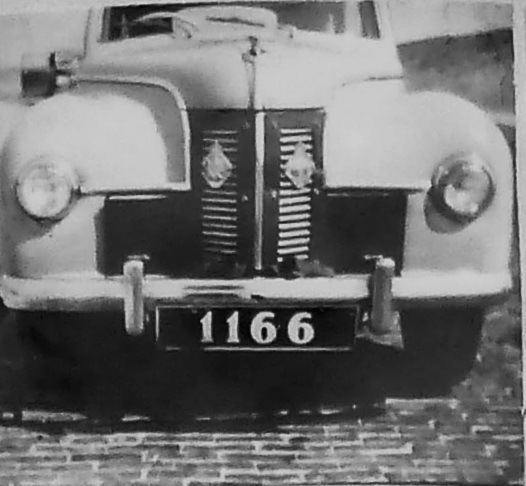 Stoel’s may have been the first great global licence-plate assembly and it was displayed in a motor museum at Dreibergen in Holland after his death in in the 1960s. Fortunately, for posterity, a set of good b/w photos exists of those museum walls prior to the inevitable disposal – and many plates were saved from the landfill by Jim – at considerable cost. Reg Wilson made this photo available to the editor many years ago, possibly after a visit to Dreibergen. There had been a rare ex-London Transport STL double-deck bus at the museum; I also made a pilgrimage there to view both items of interest, but by then it had closed, to my lasting chagrin. It was known that Karel Stoel had also accumulated some thousands of photos of world plates in a set of over 20 100-page albums, which went off the radar until 2015, when a curious Mr. Fox, during a visit to Europe, joined with his old pal and veteran collector Jacques Lambin and set out to try to unearth that second, paper, tranche of Stoel’s treasure. They located retired enthusiast Joop Korf (former Europlate member #0003) of Rotterdam, who had acquired the albums from Mr Stoel’s widow after he died in the late 1960s and quietly kept them safe in his loft for over fifty years! Europlate came to know of the archive and asked Jim if he could arrange with Joop for Europlate to purchase, if Joop would be willing to part with them. A mutually satisfactory transaction ensued, thanks to Jim’s good relations with Joop. EU 0038 Victor Brumby immediately volunteered to drive over from GB to collect the books in early February 2016, met Mr. and Mrs. Korf at their home over excellent tea and cakes, and loaded a Volvo estate with Karel Stoel’s life’s work. After an overnight in Bruges, Angela and Vic returned via the English Channel ferry and the albums took up their new home in Britain. Soon after, two of the albums were shown at the Easter Europlate Convention in Vaduz to general acclaim and volunteer members were sought who would be able to convert the original paper images to the modern digital form, by scanning, separating, enhancing, identifying, dating and cataloguing. Antonio Barragan of Madrid and Jean-Emmanuel Chevry of Albi, France, nobly volunteered to share the task with Vic and each took one of the Stoel albums home from to Vaduz, to begin the process – which is quite time-consuming! By this means every Europlate member will eventually have access to a magnificent historic archive of licence-plates of the world, from their inception at the turn of the 20th. century, to about 1970. 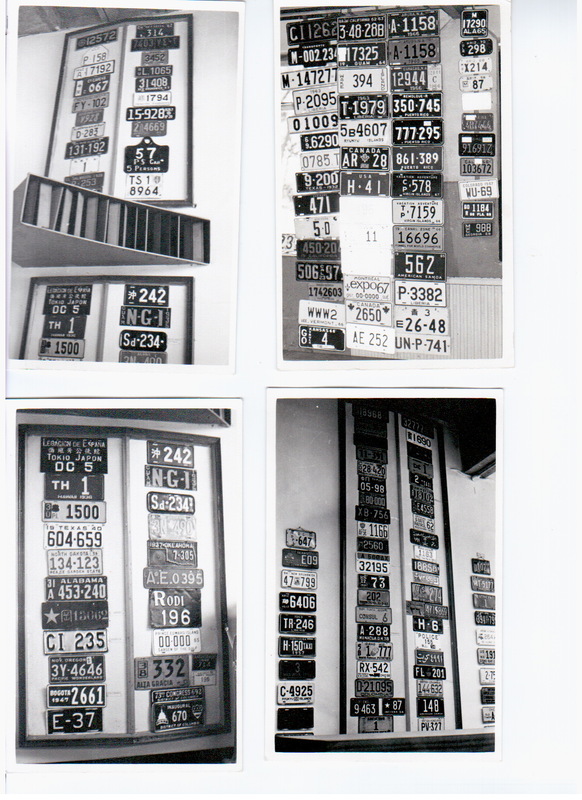 More modern plate records are easily found from a wide variety of other sources and the special characteristic of this unique archive is the historic recording – and also, these pictures mainly illustrate the plates ON their vehicles, rather than as plate portraits. We had already created an amalgamation of the photo collections of four Europlate earlybirds – Ray King, John Pemberton Eu 0083, Vic Brumby Eu 0038, Terry Gray Eu 0009 and Bernt Larsson Eu 0028, with more members offering their pre 1980 pictures to be added as time allows. The Stoel collection, which will be the biggest contributor to the final archive, is being merged with the ‘Earlybirds’ amalgamation, the total of which will eventually render a superlative reference facility for members present and future. The intention is to make the entire collection available to all currently paid-up Europlate members by access through the RPWO website. When it’s up and running, we hope that more details – and corrections – might be added to individual pictures by knowledgeable members, if they will kindly communicate the new data to the editors. Members without computer equipment or smart-phones can access the material by using a friend’s machine – in fact – any device, anywhere, which has access to the worldwide web. The entire work will probably take two years, with so few members working on it, but countries will be released on RPOW for exhibition one at a time, as they are completed. Volunteers for sharing the project will be enthusiastically taken in, if they can perform the necessary digital functions. Members Cedric Sabine (Eu 0740) and Pieter Lommerse (Eu 0443) and John Harrison (Eu 0078) have kindly dismantled lots of digital pages for us, of the countries in which they have a special interest, and that helped to prepare the images for the subsequent sizing/editing/titling processes. Our webmaster John Northup is working on the possibility of attaching the archive to our Association website RPWO and news of that launch must be imminent (!) UPDATE 8 Feb 2017: The inclusion of the new photo collection WITHIN the RPWO website transpires to be technically impossible, and so it will be viewable at its own web address, accessible to current, paid-up Members. It is too big to download, unless you have mega-memory, so one opts for VIEW ONLY, and as often as you please. 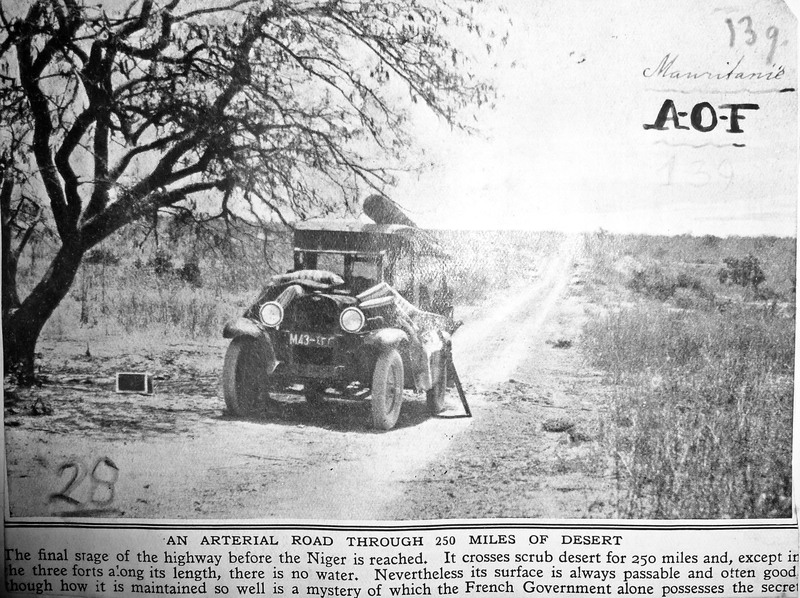 Mauretania M 43 when it was part of the French Sudan, using the 1920-52 series from the AOF – French West Africa. 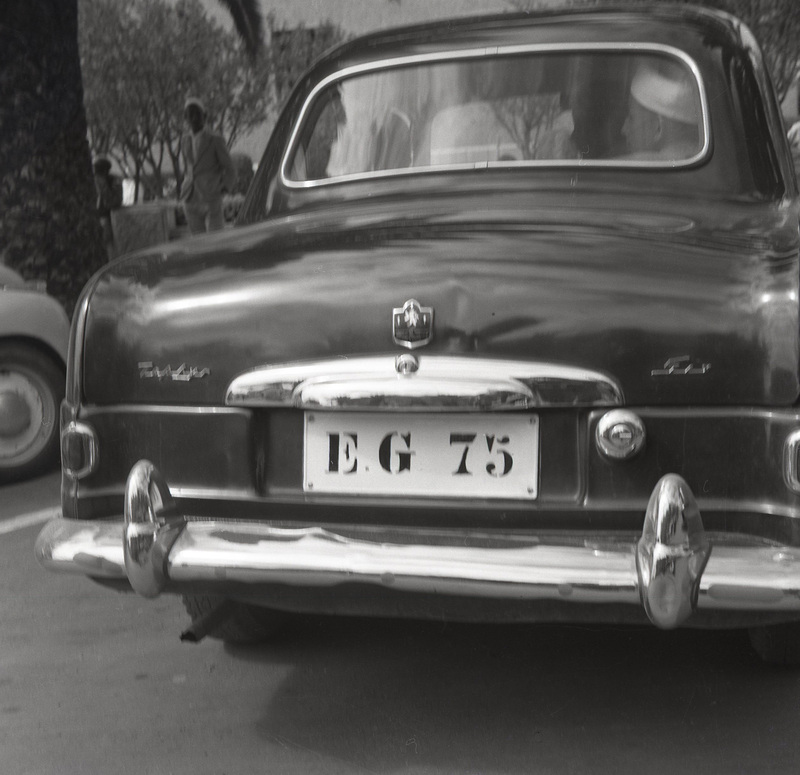 Government of Eritrea EG 75 circa 1951, on a Ford Zephyr Six. Assumed black on white, and in the capital, Asmara. Nigerian regional code CM 1762 from Victoria, in the British Trusteeship of the former German Kamerun (1916-1940s). British Cameroons, aka Southern Cameroons (1940s-1960), amalgamated with the former French Trusteeship (TC) as the Cameroun Republic after independence in 1960, when the united country adopted the international oval (CAM), then, over the years, RUC, then CAM again, then CMR. Formerly it had used TC or WAN, for either the French or the British/Nigerian sectors. Is this a record for international ovals?? 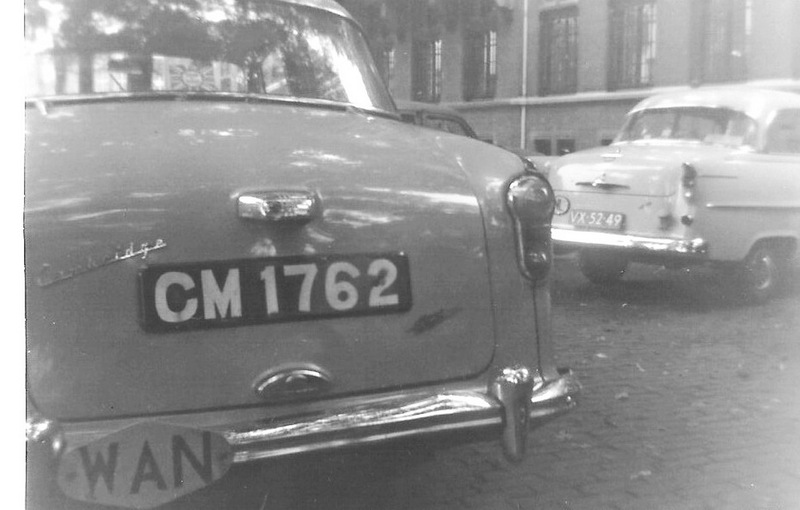 CM 1762 seen here in 1950s Holland on an Austin A55 Cambridge by Mr. Karel Stoel, who was among the very first collectors of plate data, from the 1920s, and who passed away in 1966. 1166 — SURINAME used this numeric-only system from the 1920s to 1954. Amazingly, a British-built Jowett Javelin (flat-four rwd) made its way there for this circa 1950 photo. Most pictures show that former Dutch Guiana mostly used painted plates – and several others show the (SME) oval. Some interesting oddities, aren’t there? This entry was posted on Friday, September 30th, 2016 at 1:14 pm and is filed under Stoel collection. You can follow any responses to this entry through the RSS 2.0 feed. You can leave a response, or trackback from your own site. 5 Responses to Karel Stoel Albums – A Historic Find. My compliments for the excellent story on the Karel Stoels collection. I read it with much interest and pleasure. To be honest: I’m still very happy with the deal made one year ago with Jim Fox. And of course I’m happy that I bought the books from Karels widow at the end of the sixties. As well that I saved the books, thanks to my wife, so long time on the ceiling of our house in Rotterdam and Bergschenhoek. I have one minor remark on your elaborated article. Karel Stoel is from Utrecht. And not from Rotterdam. He lived in an old house at Poortstraat 12, not far from the center of Utrecht. By the way, we will meet Jim and Jill Fox mid October in Tucson/Arizona. Thanks Joop – your amendments are now made! I am the daughter of Karel Stoel, Marianne Stoel and I foud this on internet. I am sorry that I did not see your blog note until just now (in Kuala Lumpur), Marianne. I believe that now, Pieter Lommerse, a Dutch friend and member of the international plate club, has contacted you because he wished to write a testimony to your father, whom we all admire. His photo collection has been scanned (well, half of it – it is very big!) and so can be shown to the members of Europlate (q.v.) around the world. You may be proud of your father’s lifetime obsession – he had a great eye for detail!